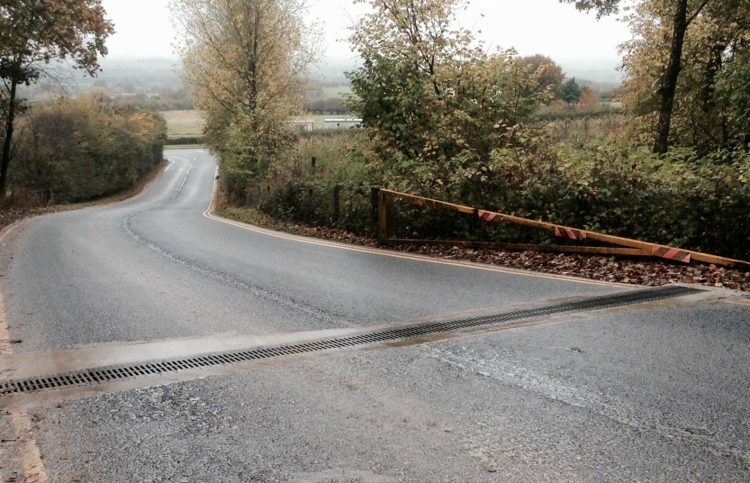 The first run of Hauraton’s FASERFIX® BIG SLG channel system has been installed in the UK across an access road leading to the Tarmac Leapers Wood stone quarry, east of the M6 motorway at junction 35 in Cumbria. Just off the B6254 the quarry access road falls steeply towards the open cast facility. Rain water running from the entrance of the quarry contained a lot of silt and this was ultimately blocking up the culvert ditches on the main road – a problem highlighted by the Local Authority. A channel run that traversed the road was needed to catch the water and silt and divert this to a separate catchment area. The quarry is operational six days a week and has about forty, 40 tonne vehicles per day driving in and out of the facility – an average of 480 passes every week. Where the channel had to be located was also where the vehicles had to brake as they near the bottom of the hill, so huge dynamic forces would be exerted on any channel run installed. Discussions were held between the customer, sub-contractor and the Hauraton Project Manager identified Hauraton’s FASERFIX® BIG SLG 300 channel as having the features required to answer the problem, having both the strength and wide catchment area needed. Additionally, the seven metre channel run had to be installed in one day so as not to disrupt quarry operations. The extra thick concrete surround already part of the channel meant that the contractor was able to install the channel run quickly and have enough time for the road to be reopened within 24 hours. The FASERFIX® BIG SLG 300 channel component has an overall width of 588mm, is 600mm high and comes in one metre lengths. 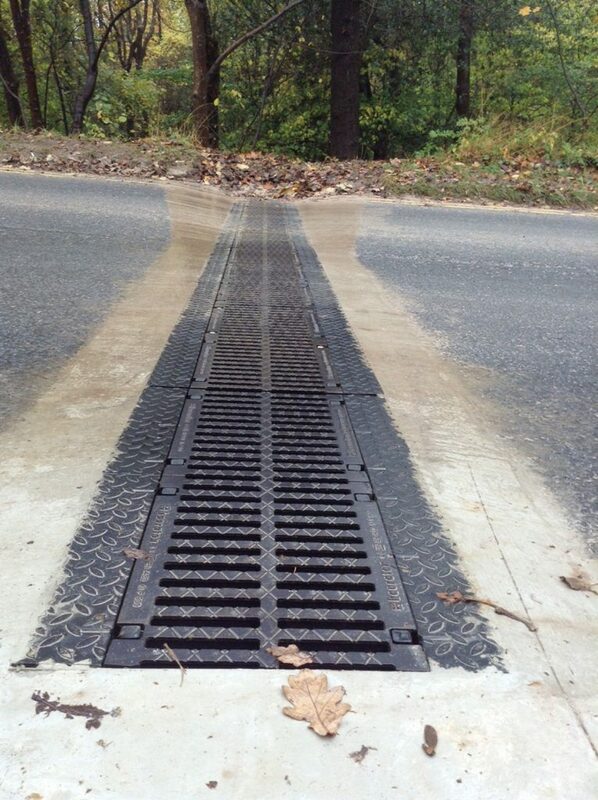 With a nominal size of 300mm the channel has a drainage cross section is 1020cm². 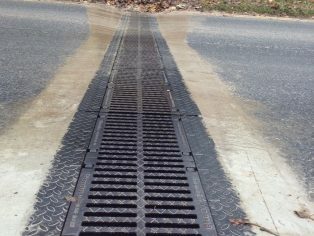 The each length is made from the company’s Fibre Reinforced Concrete (FRC) and features 6mm (nominal) thick ductile iron plates permanently moulded onto its top edges. These reinforced edges together with the ductile iron; 14mm grating, provides exceptional wear and load resistance which easily complies with the EN 1433, F900. Each half metre grating is held by four high tensile bolts. “The FASERFIX® BIG channel was specifically designed to be a high strength, wear resistant and quick to install system where a reduced volume of concrete is necessary in the site foundations. Before this first installation in the UK, the BIG system had been installed in container depots, power stations and major airport runways thorough out Europe, where the toughest channel system on the market needed to be specified”. For related Case Studies go to www.drainage-projects.co.uk.